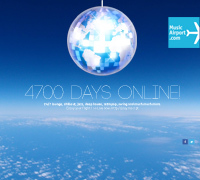 Now on: 4700 DAYS ONLINE! What were you doing 4700 days ago? Your webradio on the fly! whether on a real plane or just with their own spirit. We love the idea of sharing our passion for good music: listen to our playlists! Many artists might sound pretty new to you, dear passenger. Go discover them. You may like some cool live events too! Patrick Smith, a 38yrs-old-pilot hosting "Ask The Pilot" on salon.com can be found here. Want to know everything about your favourite airline? Check-in here. Or check the current delay status of the major airports here. Photo Galleries and more at the Flight Gate. Drop a line to rise up our enthusiasm for this project! Contact us or support the project donating or shopping at our Duty Free Shop!